Didn't write anything last night because I had nothing on my mind. Nothing. I actually laid on the couch and watched Real Housewives of New York for awhile. This never happens. Never. It already feels a bit like the dog days of summer. Slow and still and humid and hot. Even the chickens are quiet. Like the air is pressing down on all of us. I walk around today and everywhere I look I think, "Who LIVES here? Who tolerates this mess and slow decay?" The depressing answer of course, is me. I never did get any okra planted yesterday. I tried like hell to gird my loins but I couldn't. After I ran to town and went to the store and came home and took the trash, I just couldn't. It took all of my energy to get ready to go to town- take a shower, put on real clothes. I have become increasingly intolerant of "real clothes." I remember a dress I had during the hippie days and I wonder where it went. It was a perfect dress. It required no underwear (and neither did my bosoms at that point) and it was made of the softest cotton and had a pretty skirt to it and it tied and it was like wearing a cloud and I loved it and where did it go? I bought it at a store in Tallahassee called Moxie which has been gone forever. Ah well. Those days are as gone as the dress, as my once-proud bosoms. For Mother's Day, May got me the sequel to Life After Life by Kate Atkinson, A God in Ruins, and it is good. I am slightly amazed that I remember anything from the first book. But I do and have slipped into this different version of that world with all of my belief and heart. What a tender, sweet joy to lay down on the bed with a new book, a hardback! My own! and to read with my eyes. Outside at night the frogs call and the owls hoot and the nightbirds wing through the ink of dark and the deep humidity of the south sets itself upon us and yet, I can lay on my bed in the air conditioning, my pillows all around me and under me and enter another world and yet, be so firmly and fully present in my own world and outside, yet another world, and isn't that how Atkinson's books are? The folding and layering and folding again of universes and worlds and places and people? Magic upon magic encased in magic and wrapped in magic and soaring through magic and then the magic of sleep. Well. That's what I'm thinking about today, this morning. I am going to skip the walk and go to town and do something with Miss Jessie. The mess and decay will take care of itself. Tomorrow, perhaps, I will plant the okra, pick up the pecan branches that fell sometime yesterday, clean out the hen house. 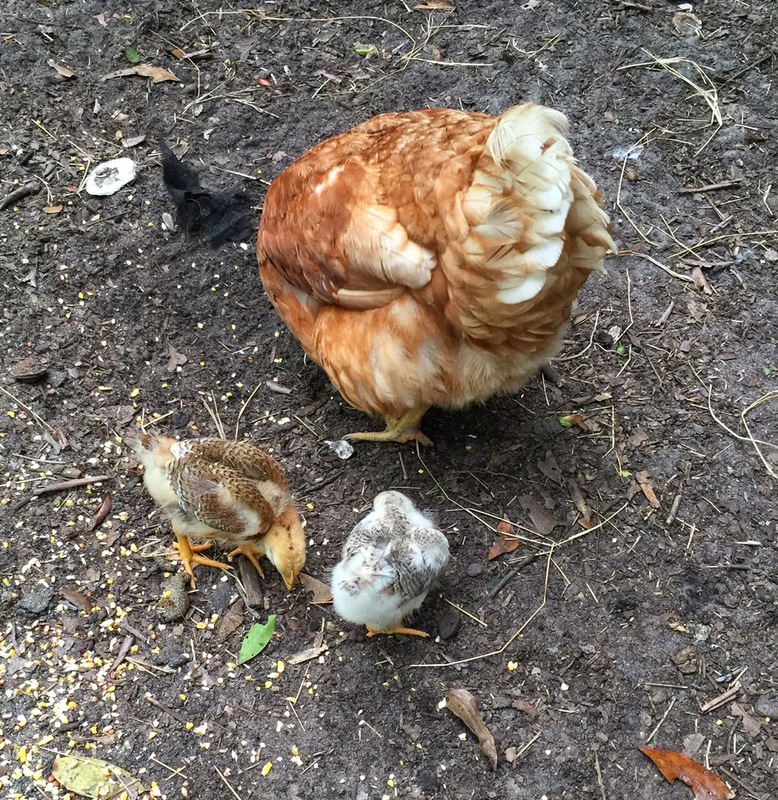 Here are the baby chicks today with their mother. Do you see the patterns their growing-in feathers are making? They are still alive, still safe, still here. Where are you today? What are you reading? Are you still in the cool, energetic, blue and purple and greening and yellow and singing thrust of spring or is it like here where you are? Sleepy and snaky and branches-falling-down and skin always a little damp with the sheen of sweat? Or is it different still? Miss Cha-Cha almost just died. I mean, two minutes ago. 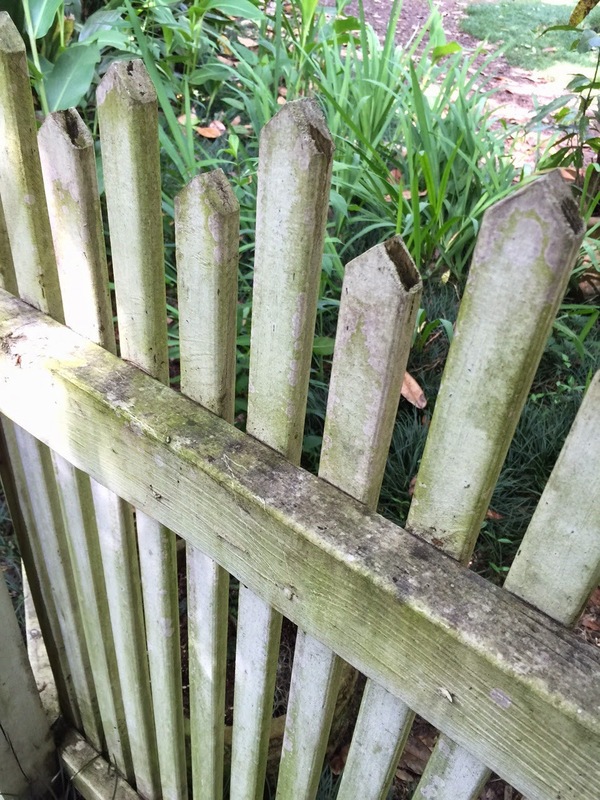 She tried to fly over the fence instead of walking down to the gate and got her head stuck in between two slats of the fence and hung there, with no idea what to do, not even making a bawk. I went out and lifted her body gently and freed her and set her down. She is as soft and light as down and was seemingly completely unconcerned throughout the entire twenty seconds it took from start to finish. I swear to you, if I had not been right here, she would have perished by unintentional suicide. So- no matter what else I do or don't do today, I have saved a chicken from a slow and torturous death. This feels monumental, even as I realize it is the smallest thing. this most recent bout of rains has kept it fairly cool. not cool really but tolerable. had the first snake encounter of the year, not me but hubby for a change. did my five sun salutations and now have errands to run in town. I loved Life After Life so will definitely look for her new one. currently reading The Fragile World by Paula Trieck DeBoard. read one of hers previously but may not continue with this one about the favorite and only musical prodigy son who dies in a freak accident at the beginning and the book is 400 pages of how it affects his family. not sure I want to invest the time. Perfect weather here! For now :) It'll get very hot soon. But its always temperature controlled here in my cube with the fluorescent lighting ...sigh. The life of a worker bee. To that chicken your presence was not a small thing. Even if the durn thing isn't clever enough to know it. Those books sound good. I've started to read actual books again lately; will look for these. We are in the on-and-off hot-and-cold of spring in California. Chilly right now. Hot again in a few days. The heat won't settle in for good until July. May and June are unpredictable. I love the way you write your world, which is a very rich and lush world, a cathedral of nature as I always think of it, and how odd that we can see the reality of a thing so completely differently depending on the day. You're hot and with a sheen of perspiration now, but it's still your magical kingdom, just another season rolling in. How very different our worlds are. It is still spring here, with blossoms floating down from trees like colorful rain, and new leaves aggressively green and waxy, and a soft breeze rustling the branches outside my window. It feels meditative. Enjoy your sweet Jessie and give her my love! In my temperate rain forest home it's still mid-spring... warmish in the sun, cool in the shade and two days of cloud/showers for every 1 day of sun. Which is great reading weather - I just finished Monkey Beach by Eden Robinson. Excellent book. I love the colouring of these chicks, they will turn out stunning princesses. We had an unseasonally hot and humid day with black clouds and I spent the day doing feck all apart from reading Barbara Kingsolver's "Flight behaviour" which I now want everybody in the whole world to read, too. You say it all so beautifully. You pay such good attention. I'm trying to read Storm of Swords. I just read a book called The Wild Oats Project that blew my damn mind. I am so dang glad that chicken was not able to off herself today. How bizarre that you saved a chicken from accidental death today! And in such a freaky way! I got a copy of the new Atkinson as well, but I'm saving it to read when I go on my three-week residency. I just finished a good little novel that was also sort of strange by Helen Lerner, I'm finishing up my book salon memoir/cookbook about Shopsin's and I have a plethora of books to choose from to read next! Chicken rescue is no small thing! Thank goodness you saw it happen and could save the day. The way you describe reading your book in your bed nest, all that folding and magic - your words are magical too. Transporting. Just like all my visits through this wormhole to you and Lloyd. We do not yet have summer, Spring is so lush and green and in a hurry, but the storms brought cold winds and we have seen temperatures in the 30's for two nights. I am sure this is the end of being cold and keeping the heat on. I can't wait to complain about being hot. I barely mentioned it the whole time we were in Florida and Georgia, it actually transported me back to my childhood summer memories and it was wonderful. I haven't committed to a new book since the one Elizabeth got me to read, and you have given me a great suggestion for when I can pay attention to words on the page again. I'm still in fresh Spring, although we just had two (for us) Summer days, with sun and everything. Back to coolness and showers tomorrow, for my daughter's communion. My house is such a mess outside that I'm afraid it will be taken for long-abandoned or bank owned while I'm away. I just went outside and pruned and swept and scrubbed like a crazy woman. Yay for saving Miss Cha-Cha! It's cool here -- almost cold -- 52 degrees yesterday morning!